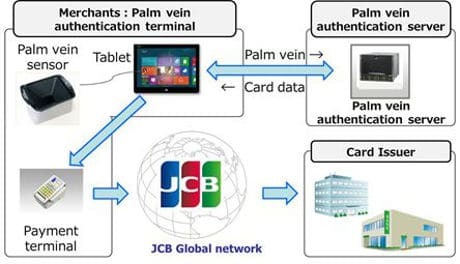 Japanese credit card scheme JCB is to pilot the use of Fujitsu’s palm vein authentication technology for payments at this month’s JCB World Conference, enabling those attending to make purchases using only their hand. Additional trials in “global markets” are expected to follow. The move follows a pilot conducted in July 2015 involving “several hundred” employees at JCB’s headquarters in Tokyo. “After linking a palm vein pattern and payment card information, customers can make a simple, fast and secure payment by using palm,” JCB says. “Multiple cards can be linked to one pattern and the customer does not need to bring his or her wallet or any mobile payment device. “We are planning pilots in different global markets in order to develop a unique biometric-based program using the most secure accurate palm vein authentication, followed by the trial at the JCB World Conference,” says Tac Watanabe, executive vice president of brand infrastructure and technologies at JCB.